Colorado Pet Fence features containment systems that use Rechargeable Collars. This extremely popular feature can save you up to $840 in battery costs over the average lifetime of each dog in your household. This enables Colorado Pet Fence to offer the “Lowest Cost of Ownership” of any professionally installed containment system in the Denver/Front Range Area. (Our competition charges up to $70 per dog / per year for their Battery Plan. Over a 12 year average lifespan of dog, this ends up costing you about $840). Let’s face it, the only reason that franchises still use batteries for their collars is because it s a huge profit center for their business. Plain and simple, there is absolutely no longer any need for batteries with these types of systems. Batteries for dog collars are a thing of the past…unless you enjoy throwing your money away every couple months! 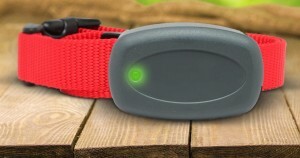 This is the rechargeable collar we use here at Colorado Pet Fence, it flashes green every few seconds to assure you that it is working and will keep your dog safe. If the light blinks red or stops flashing, then it is time for a charge. So, everyday when you put the collar on your dog, you will know FOR SURE that your collar is working properly. Unlike our rechargeable collars here at Colorado Pet Fence that have a green flashing light to let you know your dog is safe, our competitor’s collars have a wide range of issues that risk your pet’s safety. One of our close competitors don’t even have a light on their collar. The others that do have have a flashing light that only blinks when the battery is low. When that battery dies, it doesn’t blink anymore. You can clearly see how this can risk your pet’s safety, not to mention worrying you. 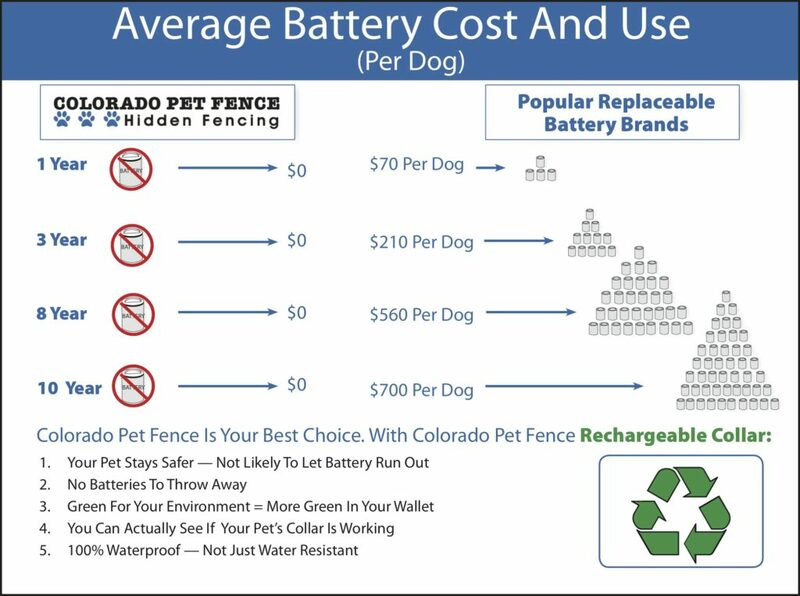 You’ll never have to worry about that with our rechargeable collar, just another added benefit for choosing Colorado Pet Fence.